It’s inevitable: No matter how carefully you pick your movers and pack your things, some items are bound to break when you move. Just accept it. Yet amid the rubble of cracked coffee tables and shattered wine glasses, we got to wondering: Is there something we can learn? Anything? 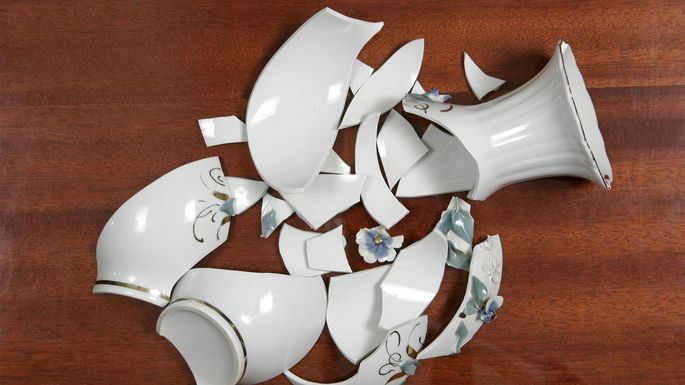 So, let’s take a moment of silence in honor of home furnishings that have met an untimely demise during a move, and listen in on the lessons they teach us about what not to do when moving precious objects from one place to the next. Everything was going so well for Texas Best Movers, reports Erik Scheetz, the company’s owner. “We were doing a regional move, from a small town in Texas to Dallas, which required emptying a lovely 5,000-square-foot residence,” says Scheetz. The movers got everything padded and wrapped up tight, and it all went into the new home without a hitch—until they got to the family’s heirloom baby grand piano. “We’d had a light amount of rain that day, but every trip down the truck’s ramp went smoothly, so we assumed it would work for the piano as well,” he explains. Unfortunately, one of the movers slipped and fell off the ramp, causing the baby grand to hit the pavement. Hard. “The homeowner was devastated, and I had to spend $2,500 to repair a broken leg and retune all the keys,” says Scheetz. Don’t let it happen to you: Watch out for rain! It can cause slips and falls—particularly for heavier items. Larry Perlstein‘s moving woes all started with a wrong-size van. “I was leaving a condo in Connecticut and the company sent a big truck that didn’t fit in the driveway, so the movers had to back in and detach the trailer,” he explains. Perlstein was also limited by the amount of time to complete the job. “The condo association placed these time restrictions on homeowners who move in and out,” he notes. As the clock ticked down, the movers had to rush to reattach the trailer to the cab. “The rig was on an incline, so the guys had to ram the cab into the trailer over and over to get the hitch connected,” Perlstein recalls. The result? Damaged antiques, with broken, scratched legs and cracked glass tops. Don’t let it happen to you: “It could have been prevented if the right-size truck had been available,” says Perlstein. And if you’re part of a condo or HOA, read the rules so you’re aware of any regulations on when and how you can move. Overstuffing boxes is a classic recipe for disaster, says Manuela Irwin, digital marketing and business development specialist at MyMovingReviews. “Putting too much inside means the bottom could burst open or movers may drop items because they’re too heavy,” she points out. Often, book pages rip right out of their bindings and can’t be repaired. Don’t let it happen to you: “It’s easier to move two boxes that weigh 10 pounds each, rather than a single box that’s 20 pounds,” notes Lior Rachmany, founder and CEO of Dumbo Moving + Storage. Because books are weighty, spread them out as you pack and break up the labor, passing the load after one flight to someone else, he adds. Mirrors can be tricky and overly ornate ones tend to be extremely heavy, says Rachmany. “We had a customer who fired his old moving company because the glass in a fancy mirror got scratched,” he reports. Don’t let it happen to you: Mirrors are fragile, so wrap them with extra packing blankets or bubble wrap. A double layer is a good idea, so they don’t shatter, let alone scratch, says Rachmany. Clothes may not “break” like furniture, but they can definitely get drenched or damaged—which Rachmany knows all too well. “Wetness is a real problem for movers,” he explains. Rain, snow, and sleet can ruin belongings, especially if the movers are new to the job. “I’ve heard of less experienced crews leaving boxes on slushy sidewalks, which soaks cardboard almost instantly,” he points out. Don’t let it happen to you: This has an easy fix, says Rachmany: “Ask the company for waterproof plastic bins if you’re moving in winter or on a rainy weekend.” And insist that movers use dollies so boxes and bins aren’t resting on wet surfaces. Even professionals make mistakes, admits Dustin Montgomery of Moving Blankets USA. His company was driving a load from Chicago to Columbus, OH, and a couple of picture frames didn’t make the trip. “I thought we had packed these really nice frames rather well,” he says. Several of them, along with some other large framed items, were sandwiched between a mattress and box springs in the moving truck. “I’m guessing one frame hit another while we were en route,” he adds. Don’t let it happen to you: “If we’d used more moving blankets to pad the framed items, this could have been avoided,” says Montgomery.